Have you made plans for dad's special day yet? There's nothing like spending Father's Day at our Healdsburg hotel located in the heart of beautiful California Wine Country. 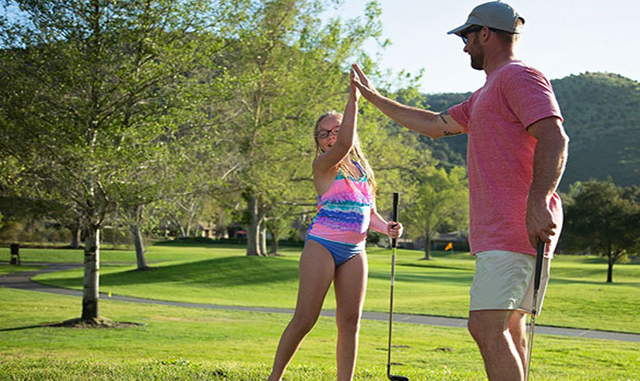 Enjoy a laid-back weekend where dad can play a round of golf, explore Lake Sonoma on a kayak, or just kick back by our outdoor fireplaces with a glass of his favorite wine in hand. When it comes time to toast dad, you can head to one of the famed wine country restaurants in Downtown Healdsburg just minutes from our Tuscan-style inn. The first step to surprising dad this year is making a reservation at Dry Creek Inn. Father's Day is on Sunday, June 16th this year, so turn this fun family celebration into a long weekend. Check in on Friday for free wine tasting in the evening or check out on a Monday to extend the Father's Day fun into a three-day adventure. Or wake up early on Saturday for a quick escape from the city and surprise dad with a one-night stay in Healdsburg. Our hotel is within two hours of San Jose and Sacramento, and less than 90 minutes from San Francisco and Oakland. Once you get your room reservations in Sonoma County, you can focus on the fun stuff - how to impress dad with an exciting calendar of activities! Healdsburg Vineyards - Nestled in the beautiful Russian and Alexander River Valleys, our hotel gives you access to hundreds of wineries. Dad can take a vineyard tour and meet local winemakers in person, then stop by the tasting room to sample the latest vintages. Looking for the perfect Father's Day gift? Buy him a bottle of his favorite Sonoma County wine that he can take home or drink back at the hotel. Exploring the Russian River - From the majestic Redwoods to paddling on the serene waters in a kayak, this natural wonderland is a relaxing spot to spend Father's Day. Lake Sonoma Recreation Area - Take dad fishing or boating just 15 minutes from our Healdsburg hotel. Lake Sonoma offers everything from ski jet rentals to picnic areas. Explore more than 50 miles of spectacular shoreline! California Golf Club - Hit the links with dad this Father's Day. Tee off for a round of 18 holes to kick off a Sunday that dad will never forget. Are you excited to explore Sonoma County with dad this year? Learn about the best Father's Day things to do in Healdsburg. Does your dad have a favorite type of food that he likes to eat on special occasions? Our wine country hotel is located just a few miles from dozens of excellent restaurants in Sonoma County. Whether he loves to savor a perfectly grilled steak with a full-bodied glass of red wine or is looking forward to an old favorite like a burger and a beer, Downtown Healdsburg is a dining paradise for any appetite. For the ultimate in wine country cuisine, you can book a table for Father's Day at Barndiva Healdsburg Shed, Spoonbar Restaurant. All of these fine dining restaurants are less than five minutes from Dry Creek Inn. You can treat dad to a gourmet farm-fresh feast starring locally-sourced ingredients, all paired with the finest wines from the surrounding vineyards of Sonoma County. For something more casual, sit down at a table at Bear Republic Brewing Co. for tasty pub food and award-winning ales. If you don't already have a favorite place picked out, discover the best restaurants near our hotel with our helpful Healdsburg dining guide. You'll find more than 40 picks from spicy Thai and Mexican food to craft beer breweries and homemade Italian. Check in to one or our Casa Siena Deluxe King rooms to make the most of your exciting weekend getaway. Dad will love the spacious layout that includes a comfy couch, coffee table, and electric fireplace. With complimentary high-speed Wi-Fi, dad can share photos of his action-packed Father's Day with family near and far. He can catch his favorite team on a 49-inch flat-panel TV, or if he would prefer to relax on a private patio with a glass of wine, you can book him a Villa Toscana King room. Each morning of his weekend adventure, dad can start his day off right with a complimentary hot breakfast featuring a variety of healthy and hearty items and plenty of freshly-brewed coffee. Learn more about all of our wine country-inspired accommodations in Healdsburg. Does Healdsburg sound like a great destination for Father's Day 2019? June 16th will be here before you know it, and dates are sure to fill up fast at Dry Creek Inn for this weekend. Reserve your room today to lock in a Father's Day to remember in Sonoma wine country.